I don’t mean virtually, either, I mean if you live locally, then you are literally invited to my first ever Jam, Jelly and Preserve Swap that will be happening this fall! Admittedly, this is somewhat of a social experiment; you don't know me, I don't know you, and we live in a sprawling metropolis, not on a neighborly country lane where we often exchange eggs for butter. But I'm doing something different and hopefully people respond. If not, I'll be eating a LOT of my own crabapple jelly! If you are not familiar with the concept of a swap, let me sing its praises! Simply put, it's a great way to head into winter (and the holidays, think gifts) with your pantry shelves laden with a whole variety of sweet and savory home canned goods, and, no you haven't been slaving over a hot stove all summer long. Sure, you'll have to do some work, but making one massive batch of apple butter, compared to something new every week, is far less work. Here's how it will work: similar to the very popular cookie exchange I do every Christmas season, I invite you to prepare a few batches of your favorite jam, jelly or preserve and bring it over. After introductions and a tasting of the goods (perhaps on fresh hot scones?) we will swap preserves and be on our merry way. It's as simple as that! 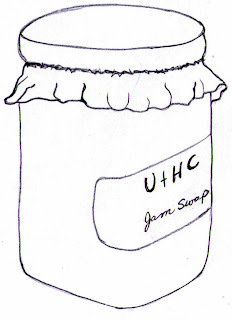 Whether you make the best peach jam in town or you’ve never canned but want to try your hand at it, I would be delighted if you packed up a couple dozen jars of your creation and joined me and others to exchange our goods! Be it traditional (grape jelly), exotic (ground cherry compote), comforting (apple butter), savory (pickles), or spicy (salsa), start planning something to bring and make a note to attend Under the High Chair's first preserve swap. You can make whatever you like; I am not a fan of pickled beets, but hey, make me a believer! 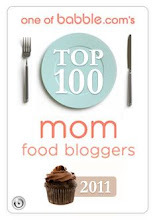 Stay tuned to this blog for details! Depending on the number of attendees, I will be booking a downtown central location for the event; however, if there are just a handful of us, it will be in my own home. I am planning the exchange for sometime mid-October, thus allowing enough time for us to turn those Cortland apples into beautiful blush pink applesauce. This is also a great opportunity to meet some of you, my readers, and one that I am super excited about! Maybe you'll even get to meet my son, the notorious picky eater, Noah. Just don't expect him to dig your homemade relish, OK? Send me an email and let me know you are planning on coming and what you will be making . I am suggesting that everyone can their goods in 250ml portions to have the same sized product throughout. This is an early 'head’s up' because right now it’s rhubarb season-with the strawberries not far behind- and some of you are already turning it into beautiful jams and chutneys. Rhubarb-strawberry jam is one of my favorites, so get out those jars! Here's wishing you a safe and happy canning season!! Damn! There's me wishing you were my neighbour again. Having been the very lucky receiver of some Under the High Chair produce, I can vouch for the superb taste of the crabapple jelly and apple butter. It travels well so it would be worth making a journey to Aimee's. Wow, now I really wish I lived in Montreal. Sure it has an overly grandiose name, but it's still one of the best resources on the web. You lucky girl you ! I love crabapple jelly and nobody here makes it or has ever heard of it,or strawberry/rhubarb. Like I said the other day I grew up in NS so moving to KS a couple years ago there are alot of things I find I miss that I can't get here,and since I'm whining why oh why can't I order Tim Hortons online it's been almost three years now since I had any! I wish I lived just a little cloder but 4 hours will be just a little too much for me to drive this year. That is what happens when I take so many trips in the spring. I wich I lived locally! Hi Lyb- Hooray! I was hoping I could entice to you make the trip. Hi Kim- That sounds great; no rush, eh? So glad you are into it! Hi Val- Wow, thanks for the award! 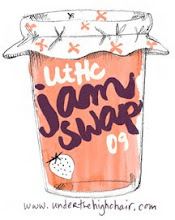 !You know, you could do a jam swap in your area. With all that local fruit...yum. Hi Amanda- :) Thanks for the vote. Hi Varina- Great tip, thanks!! Hi Jenn- Hmmm, sounds like you are ready for a taste of home. Hi hit pay dirt- Great! I would be thrilled to have you join us!! Hope you can be inspired by some beautiful local ingredient. Hi Julia- Yeah, you are pretty far, but you could try this in your own community. What a fun event :) I should try something of this sort in San Diego since there are lots of us here. That Crabapple jelly looks especially great. Good luck w/ your event! Ok Aimee! I'm going to do this!!! I love the idea of the exchange but more I want to meet you in person!!! I will e-mail you when I get back from the Okanagan where it will be decided what jam I will be making. My bet is on apricot but it may be cherry. OR BOTH!!! The last time I went home I carried back 40 lbs of peaches on the plane. Who needs clothes???? Aimee, you know you can count us in. I'll email you and let you know what we're cooking up! Great idea! Hi Missweb- Great! You can bring Jazzy to meet Noah, OK? Okanagan fruit. Wooohoo! What a treat. Can't wait to see what you come up with!! Hi Dina- Sounds great. I'll count you in! !